Whether you are an experienced Hostel Manager or a globetrotter looking for ways to extend your vagabond budget - the Hostel Jobs is the place to post your profile and worker resume. We'll then put your profile in front of Hostel Managers and Owners in the places where you are looking for a job. All over the world, hostels are routinely looking for staff. Most of all, they search for those fun-loving, social, well traveled people. Those people who know, what makes a hostel a great place to stay and how it runs - if this sounds like you, then there's surely a job for you somewhere! 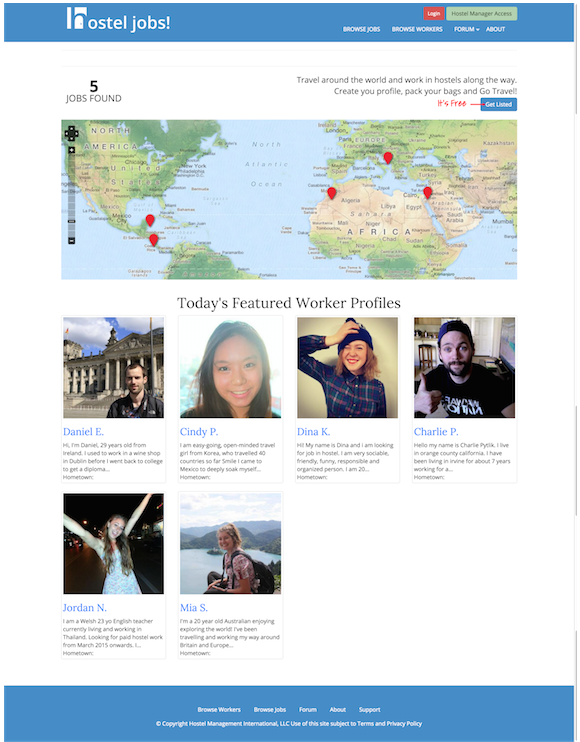 To create your own profile and be featured on the Jobs Board here on hostelmanagement.com, you need to create a worker profile on our 'sister site' HostelJobs.net- it's free! - Hostel Managers and owners, who are members of the hostelmanagement.com community, are submitting hostel job opportunities through this site. The jobs are featured on hosteljobs.net. Your profile will be featured in both places. Whether a hostel manager searches for available workers directly through the hostelmanagement.com Jobs Board or on hosteljobs.net, they can easily connect with you. You can browse through all the listed hostel job opportunities on hosteljobs.net - or even do a targeted search based on your planned travel destination(s). We have integrated these two online Hostel Job Boards to make it easier for both you and hostel managers to search, find and connect with the right people.